See more objects with the tag wood. 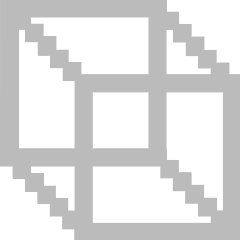 See more objects with the color darkolivegreen or see all the colors for this object. This is a Prototype fork. We acquired it in 2012. Its medium is aluminum, wood. It is a part of the Product Design and Decorative Arts department. 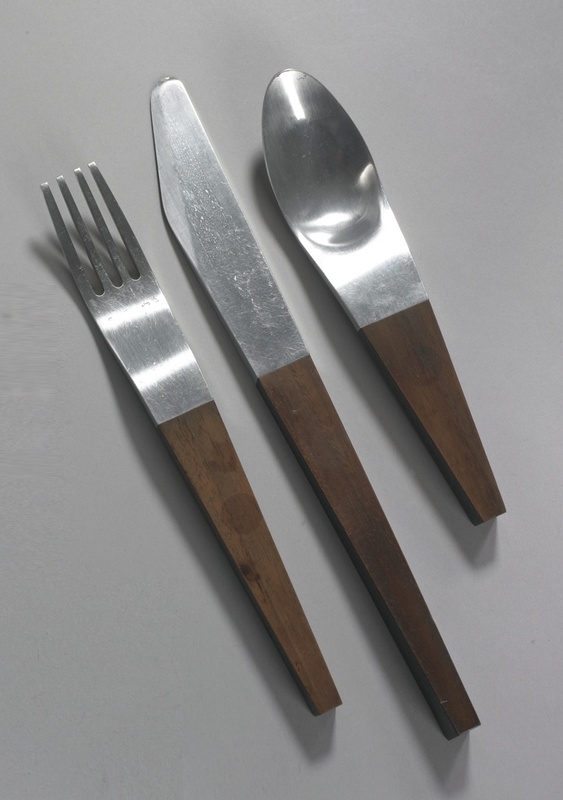 These prototypes for a knife, fork, and spoon were designed by Severin Jonassen, an American designer renowned for his later industrial design work for Philco, particularly his 1958 designs for the Predicta television. 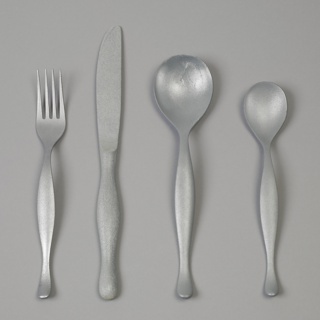 These cutlery prototypes, created when Jonassen worked for Russel Wright between 1933 and 1935, present an interesting counterpoint to Jonassen’s later work. Wright is a master of 20th-century design and a significant arbiter of modern taste, especially in designing objects for everyday use that reflect a simple lifestyle. These prototypes would add to our understanding of Wright’s business, with regards to his cutlery as well as his spun aluminum pieces. At the time of proposed acquisition, the museum holds one set of Wright cutlery and several examples of spun aluminum with wood by Wright from the same period, including mugs, pots and covers, and a tray. The museum also holds an example of the Philco Predicta, a variant of a design partially credited to Jonassen. This proposed acquisition is an opportunity to expand the museum’s collection of prototypes, which is extremely important to understanding the design process. Additionally, we are very interested in collecting pieces connected to drawings and would be able to acquire these prototypes alongside a watercolor and gouache drawing by Jonassen of the same pieces. This object was purchased from Hampton Wayt and fund: General Acquisitions Endowment.